Seawork International, Europe’s largest commercial marine and workboat exhibition, closed yesterday and was hailed a resounding success. Its usual warm, sunny weather saw over 630 exhibitors and 7,000 maritime professions coming together to meet and do business over the three days, 13-15 June in Southampton, UK. 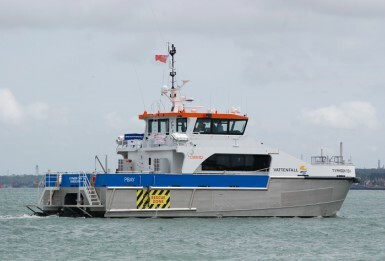 What makes Seawork unique globally is the more than 70 vessels and floating plant are on display, afloat for trial. This year saw the Southampton skyline dominated by the immense 60m x 28m Skylift 3000 jack-up submersible platform being demonstrated by Dutch based Ravestein BV. To help facilitate business, the exhibition hosts a range of complementary activities including the European Commercial Marine Awards, opportunities to see the latest innovations, new equipment and vessel launches in addition to structured networking opportunities and an engaging conference programme. Seawork 2017 welcomed returning delegations and trade association from UK, Europe and the rest of the world including naval delegations from New Zealand, Bolivia, China and Malaysia, all keen to explore procurement opportunities with Seawork exhibitors worth £millions. The new look European Commercial Marine Awards were also launched this year, with the Innovations Showcase, sponsored by Lloyds Register, receiving over 40 entries. The overall winner of the coveted Spirit of Innovations award was Blueye Robotics, with its unique, easy to deploy ROV was a clear choice for the judges. Further category awards went to MICAD srl, Dynamic Load Monitoring Ltd, Reygar and Survitec. The Maritime Sustainability Award was presented to French company, CarenEcolo. In recognition of individual contribution, the voted-for 2017 Maritime Professional of the Year was presented to Barry Sales of Cheetah Marine. The Seawork 2017 Conference drew strong audiences and explored numerous topical subjects such as business opportunities, compliance issues and the likely effects or Brexit on business, all hosted by key industry representatives.